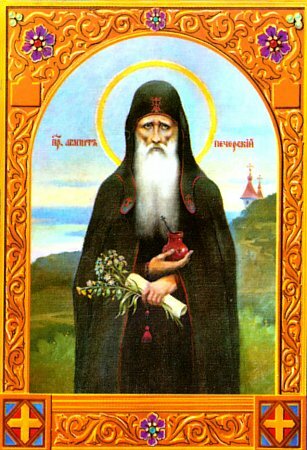 Saint Agapitus of the Caves. This holy Unmercenary Physician was born at Kiev. He was a novice and disciple of Saint Anthony of the Caves, and lived during the eleventh century. If any of the monastic brethren fell ill, Saint Agapitus came to him and selflessly attended to the sick one. He fed his patient boiled herbs which he himself prepared, and the person recovered through the prayers of the saint. Many laymen also turned to the monastic physician with the gift of healing. In Kiev at this time was an experienced Armenian physician, who was able to diagnose the nature of the illness and even accurately determine the day of death just by looking at a patient. When one of these doomed patients turned to Saint Agapitus, the grace-bearing healer gave him some food from the monastery trapeza (dining area), and the patient became well. Enflamed with envy, the physician wanted to poison Saint Agapitus, but the Lord preserved him, and the poison had no effect. Saint Agapitus healed Prince Vladimir Monomakh of Chernigov, the future Great Prince of Kiev (1114-1125), by sending him boiled herbs. The grateful prince went to the monastery and wanted to see his healer, but the humble ascetic hid himself and would not accept gifts. When the holy healer himself became sick, that same Armenian physician came to him and after examining him, he said that he would die in three days. He swore to became an Orthodox monk if his prediction were not fulfilled. The saint said that the Lord had revealed to him that He would summon him only after three months. Saint Agapitus died after three months (on June 1, not later than 1095), and the Armenian went to the igumen of the Caves monastery and received monastic tonsure. “It is certain that Agapitus was a saint of God,” he said. “I well knew, that it was impossible for him to last three days in his sickness, but the Lord gave him three months.” Thus did the monk heal sickness of the soul and guide to the way of salvation. You proclaimed your faith as a good physician. / You rebuked the Armenian and brought him to piety. / When dying you asked God for life, / And by this wonder brought him to Christ. / Now standing joyfully before the Lord / Pray for us, O righteous one!